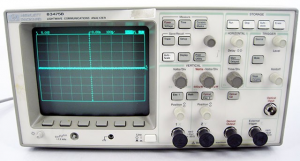 In this short episode Shahriar takes a close look at an HP 83475B Lightwave Communication Analyzer / Oscilloscope which offers a 500MHz bandwidth on both the electrical and optical inputs. The sub-sampling scope has a minor issue where the CRT brightness knob has been disconnected internally. The teardown of the scope reveals the sub-sampling ADCs, O/E front-end as well as CRT driver circuitry. The operation of the scope is demonstrated using various electrical and optical NRZ and multi-level signals.